This recipe is crazy easy and very flavorful. It just requires a can opener, a spoon, a single pot for parboiling the peppers, a bowl to mix the stuffing, and a baking sheet covered with foil. Put this dish on the table in about 40 minutes, most of which is baking time. My only warning is if you are going to use the poblano peppers, WEAR A FRESH PAIR OF LATEX GLOVES. I once cleaned the membranes out of the peppers by hand without protection and regretted it BIG TIME. Those white membranes are loaded with capsaicin (pronounced “cap-SAY-a-sin”), the chemical in chili peppers that makes them spicy. Exposure to capsaicin will cause your hands to feel like they are on fire. And don’t touch your eyes! Toss the used gloves in the trash — carefully. Once the peppers are parboiled you can handle them without gloves. Once they are cooked, poblano peppers have a very mild spicy taste and are worth the trouble. Bring a big pot of water to boil while you slice the peppers in half lengthwise right through the stem, leaving the stem in place if you like. Clean out the seeds and membranes and drop the peppers into the boiling water for five minutes to parboil. When slightly softer, they are finished, remove with tongs and set aside to drain and cool. In a big bowl, toss together corn, cheese and beans and spoon them into the cooled peppers. Top with a dollop of butter and sprinkle generously with paprika. 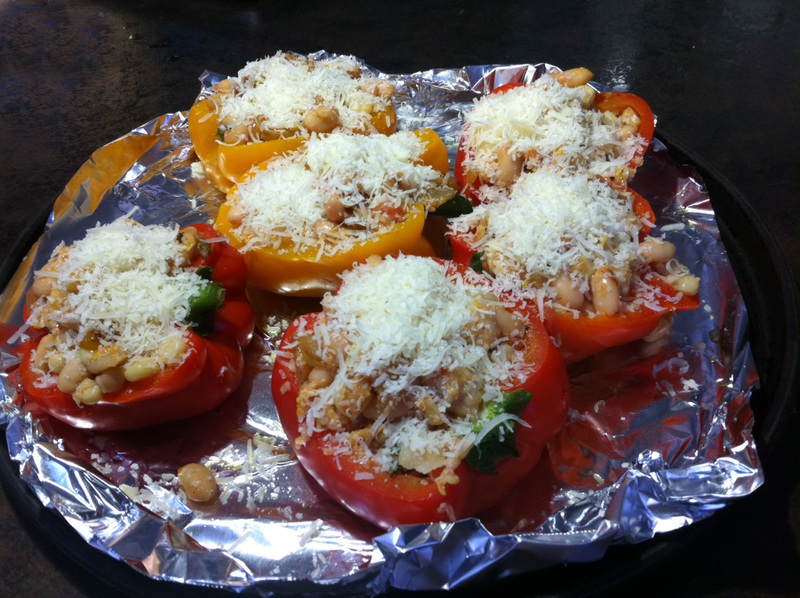 If you have extra cheese, feel free to put on top of peppers so it will brown. Arrange on lightly oiled foil-covered baking sheet. Bake for 20 minutes or so at 350-degrees until they are lightly browned on top. While peppers are baking, chop green onions, pull out salsa from fridge and let it reach room temperature. Slice the avocados last and squeeze some lime juice and shake some salt on them. Put peppers on a plate. Garnish with chopped green onions. Serve with optional add ons: salsa, hot sauce and sliced avocados.